Apologies for the lack of posts recently. I've been MIA because of a trip to the east coast, Christmas with the family in LA and general getting-together-with-loved-ones holiday cheer/obligation. I have four or five rolls of film to process as well as WAY too many digitals (in addition to the photos I'll be taking on New Year's) so the first few days of January 2011 will be busy indeed. Eternal thanks to those of you who visit this little blog and enjoy my photos. Your support really means the world to me. You rock! Sharing one of my favorite photos from the past year. 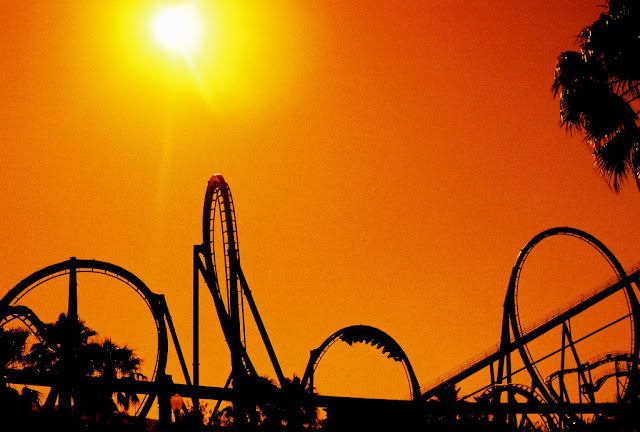 It was taken on a hot summer day at Magic Mountain using Lomography Red Scale 100 film. I think it's a great metaphor for the year's ups, downs and turnarounds. 2010 has been so great and I can't wait to see what 2011 will bring. Happy New Year!